More than half a million people will be able to cash in their pension pots from midnight tonight in the biggest savings shake up in a century. People aged 55 and over will be given new powers to decide what to do with their retirement savings and will no longer be forced to buy an annuity – which pays a monthly income for life. Instead people will simply be allowed to cash their savings and spend it how they please in what has been dubbed 'pensions freedom day'. George Osborne said the changes amounted to a 'permanent revolution' and were the 'biggest changes to pensions in 100 years. 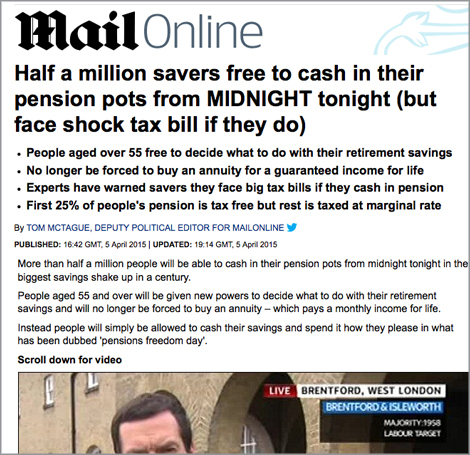 Mr Osborne urged people to make use of the government's guidance scheme and take their time before making a decision on what to do with their pension pot amid warnings that thousands of savers will be hit with huge tax bills. Overall, some 540,000 people will be able to take control of their savings tomorrow. But the Institute for Fiscal Studies has said many people face paying tens of thousands of pounds in income tax if they cash in their pensions pots. The first 25 per cent of people's pensions is tax free and the rest is taxed at whatever rate people currently pay – meaning higher earners face losing 40 per cent of their cash to the Government. The Government has set up a 'Pension Wise' guide for those approaching retirement amid concerns that some people may be hit by pension scams, or run out of money too early. Labour have warned that the government has not thought through the risks of 'rip-off charges' being taken from people's savings. 'That's why we welcomed the announcement by David Blake's Independent Review of Retirement Income that they are studying the case for a new charge cap on pension products offered to savers by their pension provider to replace annuities,' said a Labour spokesman. David Cameron today admitted that it was 'a big change' but said: 'It is their money, they've saved it and they should be able to use it as they wish. That is the principle we're introducing. The PM added: 'We want people to make the right choices for themselves. It is their money, they saved it, they earned it, and they should be able to spend it as they choose.